Livingston Manor is an early-20th-century residential subdivision located in the northwesterly section of the borough of Highland Park, New Jersey. It represents approximately one-fifth of Highland Park's growth as a suburb in the early 1900s. Livingston Manor received its name as it was built upon the lands surrounding the historic Livingston family summer home, the Livingston Homestead. The development grew primarily between 1906 and 1925 when Whittlesey's company, the Livingston Manor Corporation and its successor, the Highland Park Building Company, constructed single-family houses from plans produced by a select group of architects including George Edward Krug and Francis George Hasselman. There are many examples of vernacular Queen Anne houses, Bungalows, Foursquares, and Colonial Revival houses built for a range of working class and middle class homebuyers. The historic district was listed in the New Jersey Register of Historic Places on April 1, 2004 and in the National Register on July 7, 2004. The subdivision was the brainchild of Watson Whittlesey (1863-1914), a real estate developer born in Rochester, NY. Whittlesey was more than a typical land speculator; he was a community builder. He lived in various Livingston Manor houses from 1906 to 1914 and was actively involved in Highland Park's municipal affairs. As a young man, Whittlesey began learning the contracting business in Providence, RI. He then relocated to New York City and Newark and continued his work in the field of real estate development. By 1896, he had been elected to the board of directors for the Second National Bank of the Oranges, creating business ties with architects, builders, designers, and other real estate developers. His first developments were in Hyde Park, East Orange, NJ and Watchung Heights in West Orange, NJ. 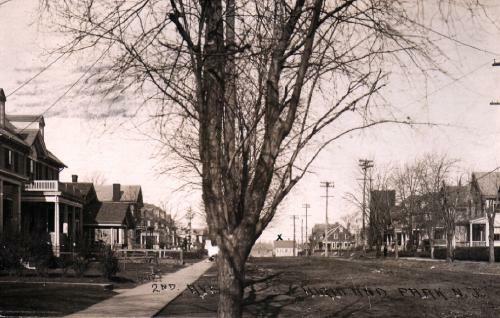 In 1906 and 1907, the houses were constructed one entire block at a time beginning with the southeast side of Grant Avenue between Lawrence Avenue and North Second Avenue. On December 1, 1906, the first two deeds were transferred to two individual buyers. The next block to be developed was the northwest side of Lincoln Avenue between Lawrence Avenue and North Second Avenue. Then six stucco bungalows were built on the southern side of Lawrence east of Lincoln Avenue. As the housing development grew in popularity, houses were constructed less systematically by block, and more often on lots that individual homeowners randomly selected from the remaining available properties. Most of the houses originally had open-air front porches, the earliest with short or tall fluted Doric columns. Those constructed later had Tuscan columns. A smooth, buff-colored brick was often used as an exterior material on some of the houses constructed between 1906 and 1910. The houses were built with uniform setbacks by block. All the lots in the residential section had deed restrictions from such nuisances as chicken coops, barns, brewing establishments, solid fences over 4-feet tall, and foundries. Whittlesey was president of the Livingston Manor Corporation, which was the landholder. The firm overseeing the development's financial affairs was Rogers & Thompson, Inc., a company established on April 9, 1906, with Watson Whittlesey as agent. The Highland Park Lumber Company, supplier of the construction materials, was formed in June of 1906. The three investors included Whittlesey, and William and Herbert Waldron. The Waldron brothers were the sons of industrialist John Waldron, who purchased the Livingston Homestead property in 1909. The Waldron’s occupied the large estate house for most of the twentieth century. Many workers in the building trades remained with the Livingston Manor Corporation and its successor, the Highland Park Building Company for a long time. Harvey E. Dodge, a builder of great skill, established the high standard of architectural excellence and beauty that the Livingston Manor Corporation maintained. Skilled craftsmen, such as Frederick Nietscke, a carpenter, Harold Richard Segoine, a contractor, and Dodge all worked and resided in Livingston Manor houses. 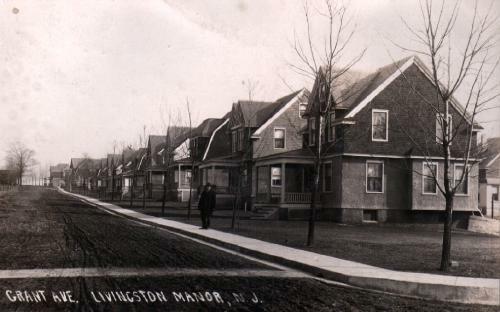 Sixty-two houses had been constructed in Livingston Manor by 1910. In 1912, Whittlesey hired a sales agent, John F. Green, and announced the sales of bungalow lots. These smaller properties were less expensive and a set of plans for a bungalow was given free of charge to any purchaser. These lots included all the modern amenities including "macadam streets, concrete gutters, curbing, sidewalks, sewers, water, gas and electric lights, and other advantages." By 1913, 120 houses had been constructed and sales agent Charles H. Bruce joined the company. 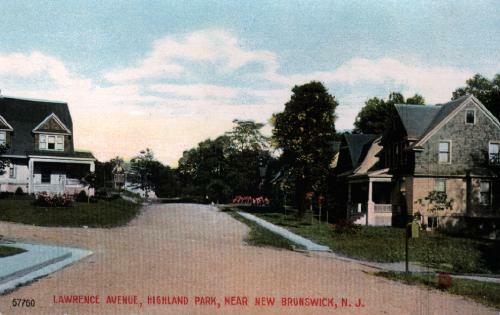 Many prominent New Brunswick and Highland Park residents secured houses in this new neighborhood. Census data showed they included several Rutgers College professors, schoolteachers, bank employees, factory and storeowners and employees. Most of the women were housewives and mothers. There were many extended families. Some families took in boarders and several households included live-in servants. Watson Whittlesey was generally well-loved and the local newspaper dubbed him "the Lord of the Manor." Upon his death on April 8, 1914, there were many tributes to him and Livingston Manor residents turned out in the hundreds to attend a memorial service at his house on Harrison Avenue. In 1915, a monument paying tribute to Whittlesey was installed at the corner of Lincoln and Lawrence Avenues. It was originally accompanied by a fountain with a light atop it set onto a stone base. This fountain fell into disrepair and was removed in the 1950s; however, a brick base with its bronze plaque remains at the intersection. The plaque reads "In Memory of Watson Whittlesey - Founder of Livingston Manor - Erected By His Friends, A. D. 1915." It is the only such commemorative plaque in Highland Park dedicated to a neighborhood planner. Whittlesey's successors included his wife Anna Wilcox Whittlesey (d. 1918) as president of the Livingston Manor Corporation, and the Highland Park Building Company. Both continued to uphold Whittlesey's vision for this community of homeowners. The Highland Park Building Company was incorporated in 1914 by long-standing members of his company, including builder Robert Lufburrow and engineer Harold Richard Segoine. The quality of the houses this company constructed in Livingston Manor between 1914 and 1925 show the same high standards of materiality and design as the houses constructed during the previous decade. Anna Whittlesey turned over Livingston Manor's privately owned streets, sidewalks, and curbs to the Borough of Highland Park by on June 17, 1916. Remarkably, there were no provisions for the borough to accept public ownership of the sewer lines. That required an act of legislation at the statehouse in Trenton, which was accomplished by Senator Florance, Assemblyman Edgar, and signed by Governor Edge the following year in March of 1917. Anna Wilcox Whittlesey, "The Lady of the Manor," died on August 16, 1918. She was remembered as "a woman of rare refinement and culture, and the soul of hospitality." Long-time business partner, Vernon J. Miller was executor of the estate and Thomas A. Davis became president of the Livingston Manor Corporation. Highland Park's identity as a streetcar suburb was transformed to that of an automobile suburb during the 1920s. But Whittlesey's initial design in Livingston Manor accommodated this transportation change with no undue strain. The broad avenues once planned to allow for trolley lines provided both abundant street parking and travel lanes. The last six years of this neighborhood's development continued to see the construction of individually designed houses filling in the remaining open lots; for example, the Mediterranean Revival style house at 252 Grant Avenue, which was designed by local architect Harry Bach in 1924. By 1922, 210 houses had been constructed. The Livingston Manor Corporation continued to have land transactions into the 1960s, but the neighborhood was almost completely built by 1925. It has always been locally recognized that this is an important neighborhood in Highland Park. Its early success provided inspiration to the rest of the townsfolk and the borough's development became quite remarkable after Watson Whittlesey and his successors showed the way.